So, I've been running a Star Wars campaign using FFG's Edge of the Empire rules and we've had great fun. The rules are pretty flexible and allow for more theater of the mind. Lately, they expressed interest in Battletech. The AToW rules are pretty daunting. 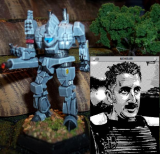 I've been playing Battletech for 15 years and have a pretty good grasp of AToW, but I would like to know if anyone has tried using FFG's system to roleplay Battletech? How difficult would a conversion be? I think it's not difficult, because in AToW you just have attributes and skills (like in Genesis). The traits can exist in Genesis because they don't require rolling a dice, so positive and negative traits can be used directly in general (having reputation, access to equipment, be a noble or having an enemy is not system dependent). Thanks, I'm familiar with the Genesis system through the Star Wars games. Ultimately, my group decided to start something else.